Architectural design team relies on tension tests carried out in the School of Engineering and Mathematical Sciences. City University London's Dr Tatyana Micic and Dr Richard Goodey (Senior Lecturer and Lecturer respectively, in the School of Engineering and Mathematical Sciences), made a vital contribution to this year's Regent Street Windows Project. The outdoor exhibition, which ran from 16 April to 6 May, featured alluring architectural shop window installations for luxury brands such as Moss Bros, Ferrari, and Banana Republic and was organised by the Royal Institute of British Architects (RIBA). For their Moss Bros installation, Delvendahl Martin Architects (DMA) explored the creative possibilities of distorting the viewer's perception of depth and perspective. This was achieved through the use of hundreds of cotton strings stitched to the edges of the window space to form a series of floating voids. The material expression of the cotton strings recalls the raw materials of garments, loom-based cloth manufacturing, and bespoke tailoring. "Several tension tests were carried out in our engineering lab on alternative types of thread. 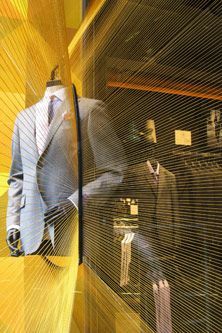 We were able to establish the amount of safe load for the thread to sustain so that consulting engineers could safely select the type of material and specify the precise number of threads required for the display." "We approached this project in the same manner as we would with any other, as a collaboration with a talented group of consultants. As part of this multi-disciplinary team, we were fortunate to have the participation of Dr Tatyana Micic and Dr Richard Goodey for the testing of materials. Determining the correct material and thickness of strings was crucial for the installation, and the feedback from the laboratory was vital in striking the balance between structural performance and visual expression. We would like to extend a huge 'thank you!' to the engineering team at City University London for their help in making this project a reality."